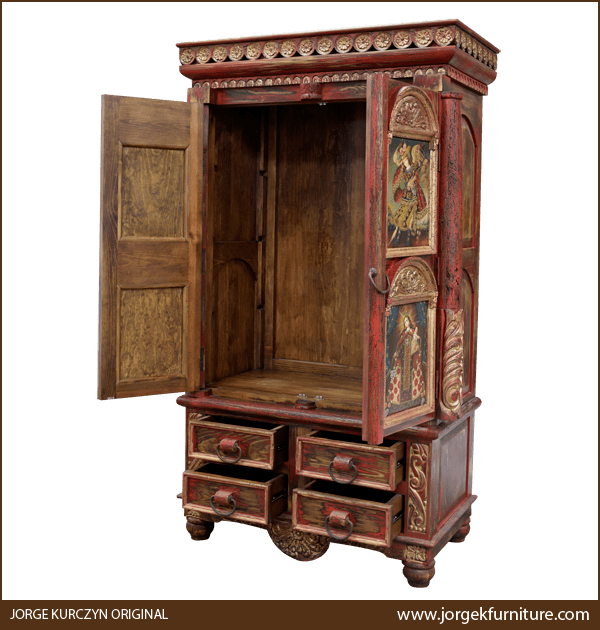 This spectacular, handcrafted, Spanish colonial style armoire can be combined with our Zoila-Elisa collection of luxury furniture. This armoire can be beautifully mixed with our Zoila bed (bed 30), our Zoila bench (bch 36), our Zoila dressers (dress 15, 26), and with our Zoila end tables (etbl 39, 40). 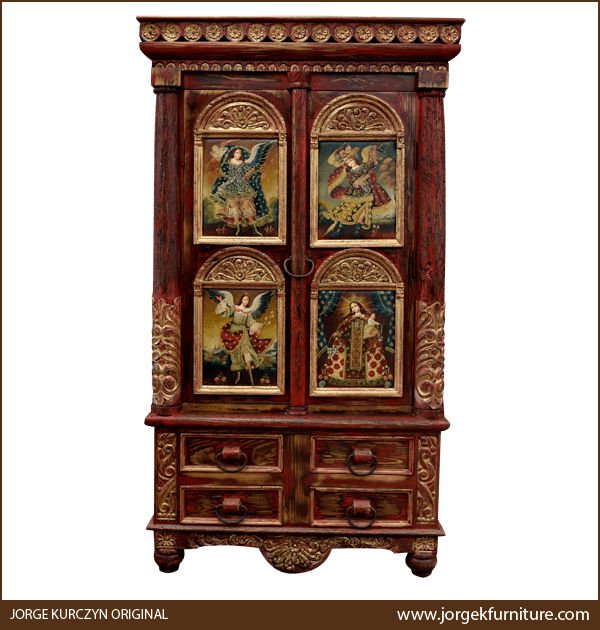 The armoire has a straight, top molding, and the front and the sides of the top molding are adorned with gold finished, hand carved, floral designs. Below the top molding are smaller, gold finished, hand carved, geometric details. The front of the armoire has two, large, solid wood doors, and each door has four, gold accented, geometric shaped panels. 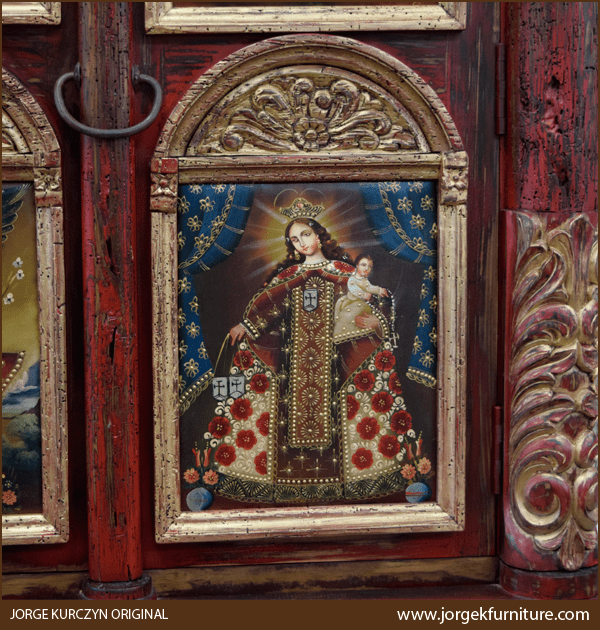 Each panel is embellished with an original, Peruvian, religious oil painting, and above each painting are arched, hand carved, gold finished, scroll designs. The panels are divided by a hand turned column, and there is a hand forged, iron ring in the center of the column. The armoire is framed with hand turned uprights, and each upright is enhanced with ornate, hand carved, floral details on its base. The lower portion of the armoire has four, rectangular drawers, and on each side of the drawers are hand carved, floral details. Each drawer has a robust, hand forged, iron handle. 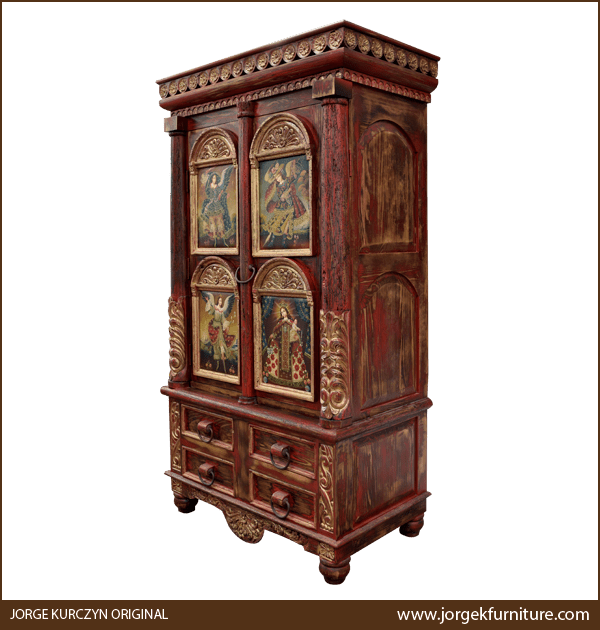 The base of the armoire has an opulent, hand carved, Spanish colonial style, curved apron, and each lateral side of the armoire has rectangular cut panels. 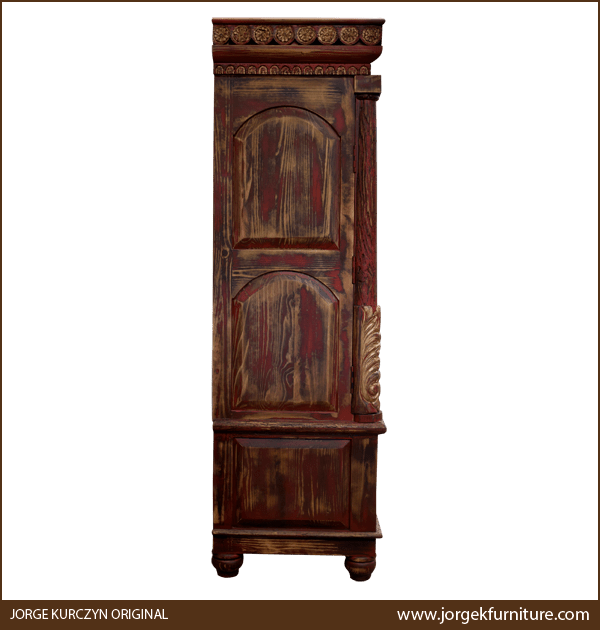 The armoire rest on hand turned, tapered feet, and it has a distressed, red finish with gold accents. The inside of the armoire has a large area for customized shelving and drawers. The armoire is made with the best, sustainable, solid wood available, and it is 100% customizable.